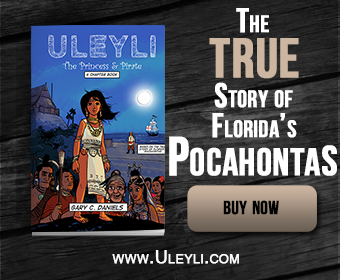 Uleyli: The Princess & Pirate is a new book about Ulele (respelled Uleyli) known as Florida’s Pocahontas because of her rescue of a Spanish captive, Juan Ortiz, from execution by her father, Chief Ucita of Hirrihigua province in modern-day Tampa Bay, Florida. Juan Ortiz was captured in 1528 and eventually rescued by the Hernando de Soto expedition eleven years later in 1539. Ulele and Ortiz’s story was then recorded in the journal of a member of this expedition, the Gentleman of Elvas, and then published in Lisbon, Portugal in 1557. Another version of the story was written by Garcilaso de la Vega in 1601 from interviews with the surviving members of the de Soto expedition. Uleyli: The Princess & Pirate uses both of these versions as source material for a much more condensed children’s book whose goal is to re-introduce children to this amazing story from the very beginnings of American history. The book is a work of historical fiction. The original Spanish accounts each provide different details, sometimes contradictory, about Juan Ortiz’s captivity. Even Ulele’s name, changed to Uleyli to aid pronunciation, is uncertain since it was never recorded by the Spanish and was an invention of a 19th-century author. Thus the book attempts to weave a narrative to make sense of the seeming contradictions while also being entertaining to children. The book is written from the perspective of Uleyli and begins the day before Ortiz’s capture. It provides a glimpse into the life of a Native American girl of elite status derived from the author’s eighteen years of research on the Southeastern Indians. The illustrations and storyline are peppered with details about life in a Native American village in 16th-century Florida including their arts and crafts, commerce, politics, medicine, social customs, warfare, religious practices, and belief systems. But most importantly it attempts to humanize these distant people to modern-day children by focusing on things they have in common like friendships, parental relationships, and the general hopes and fears shared by all human beings. Uleyli is a strong female protagonist who ultimately uses the power of her own creativity to save her new friend, her village and herself, serving as a positive role model for kids, especially young girls. Her commitment to non-violence provides a powerful demonstration that there’s more than one way to be a hero. 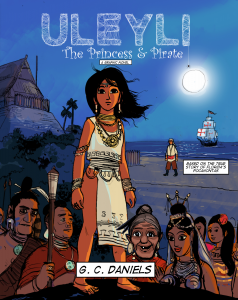 Uleyli: The Princess & Pirate is available in two versions: a 32-page, 1500-word, full-color graphic novel and a 94-page, 6500-word, black-and-white illustrated chapter book.